Pollinator Pathway | Ooh, my favorite! 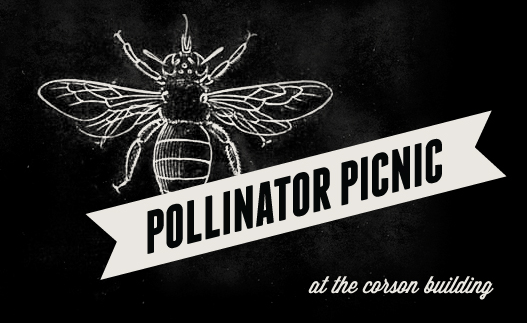 It just so happened that yesterday I had the chance to join a friend for a fundraiser to benefit the Pollinator Pathway at The Corson Building. Now when I say join-a-friend I mean we stopped in briefly before I had to head to work, so…we missed the auction, the music, the food, and the booze. (Sigh.) But still, I had a lovely time taking everything in, and my first visit to The Corson Building was wonderful! The grounds, the restored building, the amazing kitchen, and all of the original vintage touches just made me really happy. I promise, I really did try to take some pictures, but if you could only see the state of my phone you’d understand there really is no way I could take anything that resembles much of a photo. I don’t have any proof of the awesomeness that the picnic was, but nevertheless, the cause is one that I think about often. The Pollinator Pathway is a plan to provide an urban model of support to the foundation of the food web. With a mile-long series of gardens in planting strips along Seattle’s Columbia Street, the project establishes a corridor between the two green spaces bookending the project-Seattle University’s campus at 12th, and Nora’s Woods at 29th. Awesome, right! I really miss the time I would spend at the SF Food Bank, so lately I’ve been looking for the right volunteer opportunity. I was really excited to see this sweet little project yesterday, even if for just a short while. If you’re interested in donating your time or some funds click here for more info.